The Fortunes were probably aptly named because they were one of the few groups to transfer their hitmaking prowess through the transition from the 1960s to the 1970s. They were also successful at recording jingles for advertising like Coca Cola's 'It's The Real Thing', however their best known jingle should probably really have been their first hit single. 'Caroline' was adopted by the pirate radio station 'Radio Caroline' and it consequently got plenty of airplay as its main introductory jingle. This probably didn't help the sale of the record at all at the time, because few listeners were aware that it was in fact any more than a jingle, and the pirate's interest was hardly encouragement for other stations, particularly the BBC, to add it to their play lists. However the record has subsequently become almost as well known as other of the Fortunes' singles that enjoyed more immediate success. 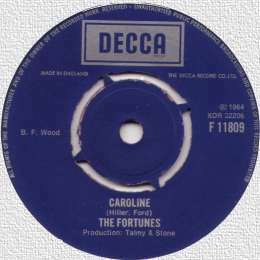 'Caroline' has long since become a collector's item and was subject to re-issuing by Decca. The copy shown here is a late repressing; original examples have the word 'Decca' 'out of its box'. The group first came together as the 'Clifftones' but changed their name at the time they secured a recording contract with Decca. All their early singles were of good quality, but they struggled for a chart presence until they cut the Cook- Greenaway composition 'You've Got Your Troubles'. They managed a total of five chart hits, four of which reached the top ten and the last of which was in 1972. Although the group had no hits during the last years of the 1960s, their popularity is beyond question- for Decca would not otherwise have re-issued the appropriately named 'Here It Comes Again' during 1969. The group continued with a few changes of personnel along the way and have survived- off and on- until the present time when they can still be found working in nostalgia concerts and cabaret.